Teddy Roosevelt gave a flower to a young Elizabeth Hull. 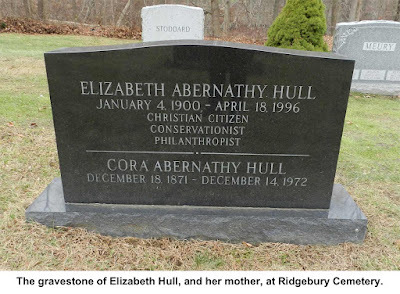 An old Elizabeth Hull gave Ridgefield countless flowers, the ground they grew on, and a lot more. A conservative, often feisty personality in the town for more than a half century, Hull supported environmental, conservation, arts, religious, and humanitarian causes, both here and nationally, and at her death gave more than $4 million to many local, regional and national non-profits. But Miss Hull could raise hell — and did, especially when the town announced it was changing her house number. Elizabeth Abernathy Hull was born in 1900 at the Government House for Volunteer Soldiers in Leavenworth, Kansas, where her father, Albert Gregory Hull, M.D., was chief surgeon and hospital administrator. Her grandfather had been U.S. chairman of military affairs under Presidents James Garfield and Theodore Roosevelt, and Hull once met President Roosevelt when she was five or six. “He gave me a white carnation,” she recalled with a smile in a 1992 interview. Her mother, Cora Abernathy Hull, was a singer and ceramics artist. Early in the century the family lived on many military bases around the country, but in 1919, moved to New York City where Miss Hull studied music, a lifelong interest. She graduated from Mt. Holyoke College in 1921. “So what?” Hull told them. So in 1936 she and Cora bought an 18th Century house at the top of Silver Spring Road, across from the Little Red Schoolhouse. Architect Cass Gilbert, designer of the U.S. Supreme Court and the Woolworth Building, had purchased and renovated the house for his daughter, but she died unexpectedly and never got to live there. Hull almost immediately became involved in her new community. For most of her years here, she was active in environmental and conservation work, and was a member and past president of the Ridgefield Garden Club. She frequently championed efforts to acquire more open space in town. During World War II, she was a member of the American Women’s Voluntary Services Mobile Transport Service, which taxied military and civilians around the area when cars and gasoline were in short supply. She was instrumental in founding the Ridgefield Auxiliary of Family and Children’s Aid, which helped the needy. She was the first president of the Women’s Town Club, an organization founded in 1956 to promote community improvements. Her interest in music led to efforts to bring concerts to town. Years ago she and Metropolitan Opera star Geraldine Farrar, who lived a few doors away on West Lane, arranged a series of musical programs. In some Farrar would sing and Hull would accompany her on the piano. Later she became a longtime benefactor of the Ridgefield Symphony Orchestra. She was a supporter of the Keeler Tavern, the Visiting Nurse Association and was a substantial contributor to a children’s hospital and a college aimed at the underprivileged. Hull was also interested in politics and local government, and was a frequent speaker at town meetings. In her later years she became somewhat discouraged with the direction the major parties were taking. “I wish they’d take all the politicians out and put women in their jobs,” she said when she was 92. Elizabeth Hull died four years later at the age of 96. Her mother, Cora Hull, had died in 1972 at the age of 101. After her death it was revealed that Hull gave the bulk of her $4.4-million estate to conservation organizations, museums and charities. The biggest grant went to the Nature Conservancy, the national conservation group. The gift of some $1.9 million came from the sale of Hull’s house for $821,000 plus the $1.1 million sale of an 18-acre parcel across West Lane at the corner of Golf Lane, which was subdivided as Golf Court. and a pond at the head of Silver Spring Swamp, was given to the Land Conservancy of Ridgefield. That tract was said to be worth nearly $1.5 million at the time. Among the many recipients of Hull cash grants were the Ridgefield Library, Community Center, Visiting Nurse Association, Ridgefield Garden Club, and Keeler Tavern. Other bequests went to various Bible study groups, several museums, conservation organizations, and charities helping the needy. She gave her Steinway grand piano to Charles Rex, an internationally known concert violinist and assistant concertmaster of the New York Philharmonic, who was a good friend. Two paintings went to the National Museum of Women in the Arts in Washington. Elizabeth Hull had strong feelings about a number of issues, including the issue of numbers. In the summer of 1969, after a lot of debate, the Planning and Zoning Commission hired a professional firm to renumber the houses, businesses, and lots along all the roads in town. For years the police and fire departments had complained about the town’s haphazard house numbering — where numbering existed; some roads had no numbers at all. The disorganized numbering may have been okay when Ridgefield was a few thousand people and everyone knew everyone, but as the town grew, it often made responding quickly to emergencies rather difficult. The commission’s renumbering followed a logical system that even created numbers for lots that might be developed in the future. The system started with the lowest numbers farthest from the center of town. “They must be mad as a hatter,” Hull declared in August 1969 as she began a petition drive to have the renumbering program rescinded. “We can easily get 1,000 signatures,” she said. Hull and others argued that while numbering houses that had no numbers would be a good idea, making thousands of people and businesses change their long-standing numbers was expensive and time-consuming. She estimated that just sending change-of-address notices to correspondents, magazines and bill-senders — plus changing stationery — could cost homeowners $125 to $150, and would cost businesses even more. Finally, she objected to the commission’s system of numbering roads starting at the point most distant from the center. Other towns, she said, number from the center and work out. In the end, Miss Hull was unsuccessful, and spent her final years at 478 Silver Spring Road instead of 1 Silver Spring Road.